Lancaster is a brand from Monaco that has been a leading expert in skin care for 45 years. Anyone who ever tries a Lancaster product is addicted for life. This product protects your tan and extends it for up to one month. It gives you a sun-kissed glow. 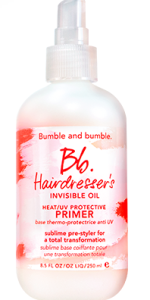 Bumble and bumble always has a hair care solution. This primer protects those locks from any fading or damage. Orly Nail Polish to the beach rescue. Put a top coat of Orly Sunscreen for Nails on top of finger and toe nail polish to protect from unwanted fading! When properly protected, you can have fun in the sun!